… back to the cake. 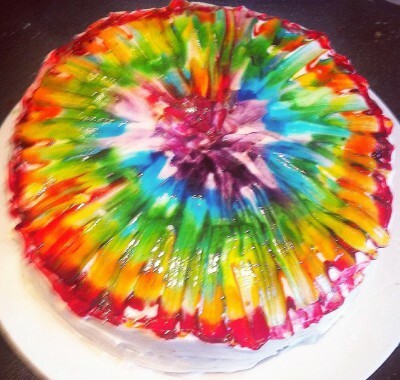 We loved it, and we instantly wanted to know how to create a tie dye cake ourselves. What better opportunity for a masterclass from the baker herself than Cake of the Month? Little did we know then that it’s also a rainbow cake inside with concentric circles of colour in the actual batter too. Legendary. First, preheat your oven to gas mark 4/170 degrees/360 degrees Fahrenheit and mix up your cake batter in the usual way – cream your butter and sugar until combined, add eggs one at a time followed by a little of the flour and mix well before adding theremaining flour and vanilla extract. If your mix is a little thick, add up to 40ml of semi-skimmed milk – adding a tablespoon at a time and stopping when you get to a consistency that you’re happy with. Divide the mixture into six bowls, and make each bowl a different rainbow colour. Line the bottom of two 9 inch cake pans with wax paper, and grease the sides. Layer your cake batter in concentric circles. Use about 3/4 of the bowl for your bottom colour, then use a little less of each colour as you continue. Layer your second cake pan in the opposite order. Melt the butter in a heat proof bowl in the microwave for 20-30 seconds, until close to completely melted. Whisk the butter until no lumps remain. Whisk in your cream cheese, again until no lumps remain. Prepare your icing sugar, and then sieve it in to the cream cheese mixture 150g at a time, stirring gently with a wooden spoon between each addition. When all the icing sugar is incorporated, pop the frosting into the fridge to chill. Once you have frosted the cake make concentric circles with the gel on the top of your cake, starting with the largest circle (I used red on the outside) and working your way in to the middle (I used purple on the inside as I did not have as much left). Using a small, flat paintbrush, start at the centre circle and brush toward the outside of your cake – you will need to wash your brush a lot to keep it from creating a brown colour. I was born in South African and my family and I moved to Qatar when I was eight. My mother taught me, my sister and our friends to bake at a young age and we took turns to make muffins and cakes to take to school. Throughout my school education and legal studies I have enjoyed volunteering and I taught swimming to children which encouraged me to get involved in various children’s charities. After university I travelled to Kenya and taught at a school for disadvantaged children in Mombasa which was a fascinating experience as I was able to immerse myself in the community. When I moved to London two years ago I decided I wanted to carry on with volunteering but I needed it to be flexible as I was looking for a job and I didn’t know what kind of hours I would be doing. I currently work at Goldman Sachs and Free Cakes for Kids Hackney provides a great opportunity for me to combine my passion for baking with my interest in charity work. I was particularly interested in Free Cakes for Kids as it is a brilliant community service which has the opportunity to bring happiness to so many children and families.